The Messerschmitt Me-163 rocket fighter aircraft, perhaps better known as the Komet, was possibly the most radical German manned fighter aircraft design to actually enter the WW II combat theatre. Here Me-163 Komet fighters of the Luftwaffe climb vertically through an 8th Air Force bomber formation and its top fighter cover before swooping down on the heavies for their short but often deadly attack. Overall size: 25½" x 36"
Adolf Niemeyer volunteered for Luftwaffe service in 1937 and served as a flying instructor until 1944, when he was transferred to Jagdgeschwader 400 (JG 400) to fly the Me 163. He stayed with this unit until the end of the war, flying a total of more than 30 combat missions in the nimble Komet. In the unit´s history Niemeyer is credited with the idea to equip the Me 163A with 24 rocket missiles, which were mounted under the wings of the rocket fighter. As time and resources were getting extremely tight, there was no time for wind tunnel testing, and so nobody knew how the Me 163 with its revolutionary wing design would react aerodynamically to the rockets. Niemeyer didn´t lose more time in tow testing, but took off under rocket power with the rocket missiles mounted under the Me 163´s wings instead. He thus became the first man in history to fly a rocket missile-equipped rocket-propelled airplane. Niemeyer continued flying after the war. Kurt Schiebeler joined the Luftwaffe on the 1st of April 1940. After graduating from pilot school, he flew with Jagdgeschwader 54 (JG 54) as Walter Nowotny´s wingman and won his first three victories in this Eastern Front unit, one Lak3 and two IL2s. In September of 1943, Schiebeler was posted to a subdivision of the Me 163 test flying unit Erprobungskommando 16, which was stationed at Peenemünde, Germany. The flight testing of the new rocket fighter concept there also involved flights with the Me 163 being towed by a twin-engined Me 110, and Schiebeler acted as tow plane pilot on more than 60 flights during this period. This posting was followed by a transfer to JG 400 in Bad Zwischenahn, Germany, which was also equipped with the Me 163 Komet. Schiebeler flew 20 missions in the Me163 including 11 flights with enemy contact. He won two victories in the Komet, both B 17 "Flying Fortress" heavies, and both in October of 1944. He was finally transferred to a conversion unit near Prague, Czechoslovakia to fly the Me 262 jet fighter, but hostilities ended before the unit became operational. Glogner was accepted for pilot training in May 1942 and posted to various Luftwaffe training units in Germany, Poland,and France. Graduated in March 1943. First posting with the fighter bomber unit Schlachtgeschwader 101 in Reims, France. 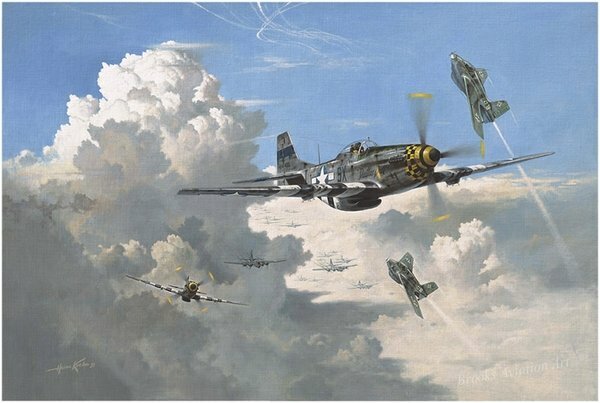 Then on to fighter training on Me 109s and FW 190s in Casseaux, Southern France. Promotion to Corporal Pilot, and transfer to JG 52 on the Eastern Front in November 1943, where he fought in all of the important battles in this theater and period of WW II, such as the battle of the Donez, the bridgehead at Kuban, Crimea, and Dnjepropetrowsk. Award of the combat fighter pilot badge in Gold. Subsequently, Glogner was posted to the experimental flying unit Erprobungskommando 16 in Bad Zwischenahn, Northern Germany, where he started flight-testing the Me 163. Transferred to the operational 2nd Staffel of JG 400 at Venlo, Holland, then to Brandis near Leipzig, Germany, where he gained an aerial victory in the Me 163 when he shot down a Mosquito over Leipzig on March 16th, 1945. This was followed by his promotion to Sergeant and the award of the Eisernes Kreuz (EK I). Before the war ended, Glogner was once more transferred to another unit, JG 7 near Prague, Czechoslovakia. Decorations include: EK I, fighter pilot clasp in Gold.